Baby back ribs need long, slow grilling to develop that succulent flavor. How much time depends on the thickness of the meat, how many slabs you are cooking and the temperature of the grill. While mouthwatering ribs take time, once started they need only occasional attention, giving you plenty of time to prepare the perfect sides. Allow at least 15 to 30 minutes for preparation. During this time, preheat the grill to approximately 300 degrees Fahrenheit, then begin preparing the meat. Start by removing the silver skin, that thin, tough membrane that covers the back of the ribs. The first time you do this it may take you a few minutes, but with practice it is easily done. Simply slip a thin knife blade beneath the membrane and loosen an edge. Grab the edge and pull the membrane away from the ribs. Season the ribs on both sides with salt and pepper or your favorite rub. Some cooks allow the ribs to marinate in the dry rub for an additional hour or two, even overnight. 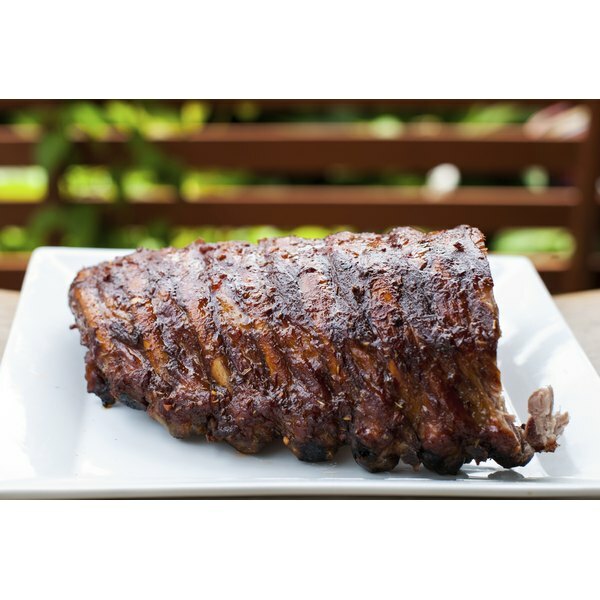 Cook baby back ribs over indirect heat using only the back burner or a side burner. Keep the temperature low, approximately 225 F, once the ribs are on the grill. One slab of ribs will need approximately three to four hours to cook to the tender stage. Allow additional time for additional slabs of ribs. Your cooking time will vary depending on grill temperature, how often you lift the lid and the outdoor temperature. Once the meat has begun to pull away from the bone, showing a little exposed bone on the ends, the ribs are done and tender enough to eat. At this point, you can remove them from the grill to serve with sauce on the side, or you can add sauce and continue to cook until the sauce is caramelized. To sauce the ribs, turn all of the burners to medium and baste the ribs in sauce. Flip them over, then sauce the over side. Allow the sauce to cook for two to four minutes on each side, then repeat the saucing, adding another thin layer. Continue until the ribs are sauced to your preference and the sauce is caramelizing on the ribs, approximately 10 to 20 minutes. While it is really not necessary to rest ribs, you need to allow them to cool enough to be able to safely grab those bones for slicing and eating. Allow 5 to 10 minutes of cooling while you finish the remainder of the meal. Once cool enough to grab hold, slice between the ribs for single rib servings. Amazing Ribs: The Best Barbecue Ribs You've Ever Tasted!